Hello! This is Karla from the Social Media Design Team. With all these graduations and summer celebrations, I wanted to share these quick treats I made and dressed up with DCWV paper. 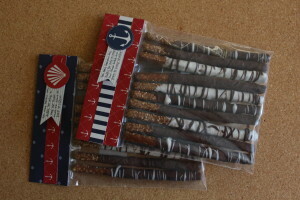 These are pretzel rods dipped and drizzled in chocolate melting chips (I like the Ghirardelli ones). I put them in a ziploc bag and made a topper with Seaside Yacht. So easy to dress up a simple treat! 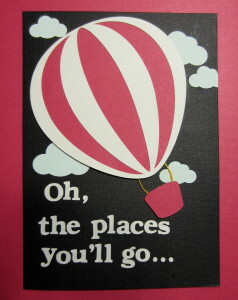 And here’s a graduation card idea for you. I made this using only the DCWV Neutral cardstock stack on a 5×7 black card. Love all the texture. I used my Xyron sticker maker to make the small parts sticky. 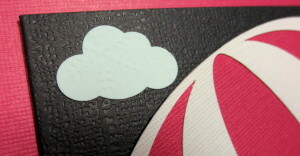 I also used pop dots on the hot air balloon. Oh, and I borrowed the phrase from Dr. Seuss!